Learn everything there is to know about pokies with our in-depth articles based only on the facts. We cover all aspects of the games from how they really work to how to play and how they came to be so popular. We also give you some tips for winning and keeping things fun. There is a lot of misinformation found both online and offline about how the pokies actually work. We give you the inside information, show what is inside of every game and how the outcome of every spin is decided. In terms of complexity, Aussie pokies are one of the simplest forms of gambling to learn. We take a look at one of the most common button layouts and show you what effect each of the buttons have. While there were slot machines in Australia as early as the 1900's it was not until 1956 when the government of NSW decided to legalise the one armed bandits for use exclusively in registered sporting clubs. Have a question about pokies? Check out our Frequently Asked Questions section where we answer the most common questions players have about Australian poker machines. We explain all of the commonly used poker machine related terms which should give you a better understanding of the language used in our reviews and on the games themselves. While there is no guaranteed way to win consistently when playing any type of slot machine there are some simple tips and strategies that you can use to get the most out of your gaming experience. Find out how the payout percentages on poker machines really work and why the game RTP's for online pokie games are typically much higher than those on the games found at pubs, clubs or casinos. Did you know that there is one bet on pokies that has no house advantage? The gamble feature has natural odds so in some ways is the best possible bet you can make when playing pokies. Find out about VIP gaming and playing high limit pokies both online and offline. We look at the options for playing for high stakes as well as at the rewards you can expect when you're a true high roller. All forms of gaming come with the fact that you will probably lose money. Keeping things fun is the most important thing when it comes to gambling and this article covers information on what to do if things get out of control. We take a look at the most popular games that are found in pubs, clubs and casinos in Australia as well as found in casinos around the world in places such as Las Vegas and Europe. The pokies are the most popular form of gambling in Australia and this guide looks at some of the facts and figures relating to poker machines and the answer to who are really the biggest pokie winners. Find out about the manufacturers of pokie machines. Learn out about their history and how the Australian style games are now being exported all over the world to casinos in places such as Las Vegas. There are a total of 13 casinos located in Australia with at least one is each state and territory. Find out about the various casinos including The Star, Crown Melbourne, Treasury Casino and Jupiters Gold Coast. Compare the poker machine regulations in the various Australian States and Territories. We list the minimum return to player, max bets, win limits, amount of games in each jurisdiction, cheque rules and more. If you're looking to play pokies online for the first time then we suggest reading our new players guide which covers important topics that should ensure you have a positive and fun online gaming experience. If you've got a question about online gambling in Australia or New Zealand the check out our frequently asked questions section were we give you the answers to the most common questions. To play for real money online you will need to be able to deposit money into your casino accounts. This guide covers the most popular banking methods as well as information on security and player identification. Find out which companies are the major players in the online casinos software business and why the majority of players cannot access the online games from Aristocrat, IGT and WMS Gaming. Online gambling has it's advantages and disadvantages. Find out about the pros and cons of playing online and see why we believe that online is a better option compared to playing at your local venue. 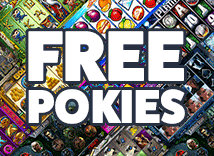 A collection of resources relating to either pokies or gambling in Australia found on the Internet including manufacturers, media and videos as well as recommended websites. Please gamble responsibly. You must be 18 years or older to use this website, play pokies or participate in gambling.